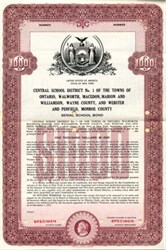 Beautifully engraved Rare Specimen $1000 Serial School Bond Certificate from the Central School District issued in 1951. 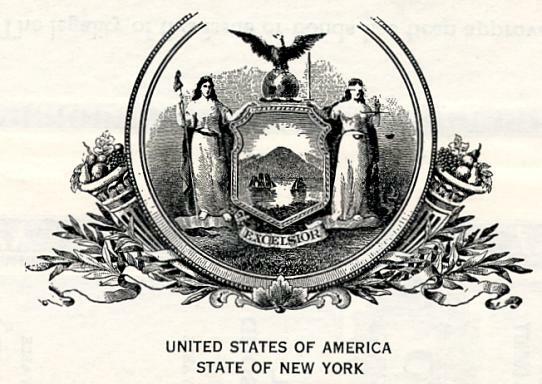 This historic document was printed by the Security Banknote Company and has an ornate border around it with a vignette of the New York State Seal. This item has 58 coupons attached and is over 55 years old. We only have one. These certificates are normally stamped "Specimen" or they have small holes spelling the word specimen. Most of the time they don't have a serial number, or they have a serial number of 00000. This is an exciting sector of the hobby that has grown in popularity over the past several years.